Nylon Washers | New Process Fibre Co.
New Process Fibre is unique in several ways. We believe that our ability to provide OEMs with cost-effective and innovative stamping solutions for nonmetallic parts is second-to-none. Moreover, our huge inventory of die-sets gives us the ability to turn around both large and small runs very quickly. That is why we are viewed as industry leaders in the fabrication of nylon washers. Check out our catalog section here to see if our washers are a fit for your next project. Washers evenly distribute pressure from a nut or bolt across the surface to which it’s fastened. Washers also protect the surface from damage by separating it from the fastener. In addition, washers help mitigate the threat of vibrations or other environmental factors that may loosen fasteners over time. Applications across many industries can use nylon washers. For example, medical manufacturers use nylon washers to produce medical instruments, the plumbing industry uses nylon washers to provide durable and reliable seals, and the fire safety industry uses nylon washers to build trustworthy sprinkler systems. A huge inventory of materials, including several types of Nylon — in various colors. Nylon — perhaps most well known as a common fabric in clothing — is actually a strong and highly versatile material that is used in all sorts of demanding industry applications. For instance, the medical industry uses Nylon to make medical instruments; the plumbing industry uses Nylon to provide trustworthy seals; and the fire safety industry uses Nylon in sprinkler systems due to the material’s reliability. At New Process, we use Nylon to make flat washers with exceptional performance characteristics. We use four different types of Nylon: Nylon 6, Nylon 6/6, Nylon MDS, and Nylatron®. Nylon 6 is the same material found in fabric, but we use it as a replacement for brass, steel, aluminum, and other metals. Its high strength makes it suitable for gears, spacers, washers, and plumbing parts. Nylon MDS is a type of Nylon 6 designed for food grade applications. It is also the hardest and strongest type of Nylon, so it is well suited for moving components such as gears, bearings, and wheels. Nylon 6/6 is a high viscosity Nylon with exceptional strength and temperature resistance. It is often used in chemical and electrical applications. Nylatron®, a trademark of Quadrant, is a Nylon 6/6 and Nylon MDS blend that is self-lubricating and therefore has very low surface friction. It is used in applications where lubricants are not suitable for various safety or practical reasons. Nylon and Teflon are both versatile synthetic polymers that offer higher mechanical strength thresholds and better resistance to friction than traditional metallic substances. Industries across the board use both nylon and Teflon washers in many applications. However, several noteworthy differences exist between nylon and Teflon. Each material is made using different chemical processes. Nylon forms when an amide reacts with dicarboxylic acid, and Teflon results from the polymerization of tetrafluoroethylene. This means that nylon and Teflon each have specific physical and chemical properties. For example, nylon is hydrophilic (meaning it tends to mix with water), whereas Teflon is hydrophobic, or water repellent. Therefore, Teflon is a better choice of material when building machinery that requires higher-than-average amounts of lubrication. Manufacturers typically use injection molding to build nylon washers. This forms nylon into the desired shape by injecting molten polymers into molds. For most production requirements, nylon stamping (also known as punching) accurately mass produces identical parts at relatively high speeds. Injecting molten material in molds often leads to the formation of bubbles or other irregularities that affect the production run’s uniformity. 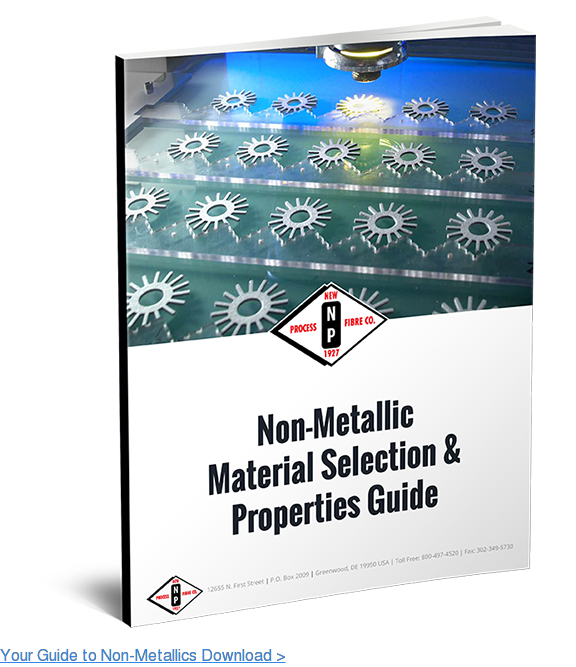 In contrast, nonmetallic stamping creates uniform products with little or no visible abnormalities. This is due in part to how the stamping process can shape an entire set of “blank” materials in just one operation. While the output levels of high-speed stamping equipment may vary, it’s possible to attain punching speeds of up to 400 strokes per minute via nylon stamping. Nonmetallic stamping presses can produce as many as 200,000 nylon washers every day, whereas injection molding can only create approximately 25,000 parts per day. Injection molding may require new molds for each part. However, manufacturers can simply adjust their nonmetallic punch presses to fill the desired order for the customer. This keeps tooling costs down and fills higher order volumes over time. All these factors contribute to increased cost effectiveness for nonmetallic stamping as opposed to injection molding. One of the most commonly used hardware products is a washer, which is a thin disk typically used for distributing the load of a threaded fastener such as a screw, bolt, or nut. Washers are highly useful as they not only prevent corrosion, but they can be designed for a large range of applications. Furthermore, they come in a wide variety of materials, including aluminum, bronze, steel, copper, and nylon. Nylon is a synthetic material that can be melted into various shapes and fibers. 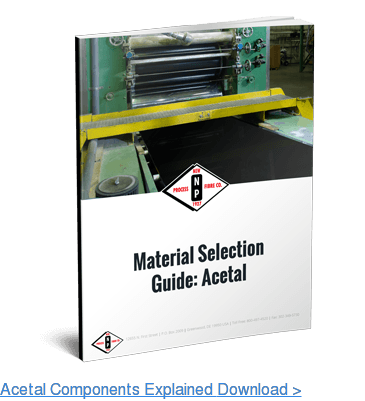 Known for its versatility, nylon is a popular option for its machinability, chemical and abrasion resistance, and flexibility. It comes in a number of types, including Nylon 6, Nylon 6/6, Nylon MDS, and Nylatron®. Nylon is also a non-flammable material that is non-toxic as well as weather resistant. Because of these properties, nylon is often the preferred material for washers. Nylon washers are particularly useful as a lightweight, durable alternative to standard metallic washers. Offering excellent insulation and strong adsorption properties, nylon washers are ideal for chemical and electrical applications. These washers are valuable for their ability to maintain their appearance and performance over a prolonged period of time. Nontoxicity: Although metallic substances may release corrosive and toxic byproducts over time, nylon is an inherently nontoxic material. For this reason, many producers use nylon washers in food processing equipment. High cost efficiency: Nylon washers can be strong and durable, allowing them to resist impacts better than metallic washers. Because of this, nylon derivatives such as nylon MDS are strong candidates for use in machinery components. Nylon washers weigh less than other washer types while preserving their ability to be tough and flexible. This boosts your vehicle’s fuel efficiency and extends its life span. Black nylon washers resist harmful chemicals, meaning that they won’t weaken or corrode from contact with petroleum-based substances or engine oil. These washers are also versatile, allowing manufacturers to use them in highly specialized automotive applications. standard metal washers in plumbing applications. PTFE is totally impermeable to water, water-containing substances, oil, and oil-containing substances. For this reason, it’s an ideal choice for plumbing applications, and manufacturers of plumber’s tape (also called thread seal tape) use this material in their products. PTFE also provides good thermal and electrical insulation, and it has a low coefficient of friction. The impact strength and energy absorption attributes of Nylon 6 increase with moisture absorption. However, exposure to moisture may also decrease its stiffness and tensile strength. However, when plumbers properly account for these negative effects, Nylon 6 washers benefit applications including showerheads and faucets. Since 1927, New Process Fibre has provided innovative fiber solutions to our clients. With state-of-the-art tooling and a wealth of expertise, we consistently exceed customer expectations on a wide variety of projects. Contact us today at New Process Fibre to learn more about how using our nylon washers will benefit your applications. 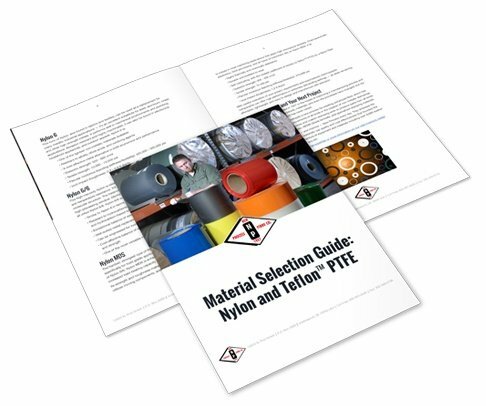 Nylon materials from New Process Fibre meet all LP-410 Standards, ensuring that quality is met for custom shapes, washers, gaskets, spacers, and insulators. We offer nylon flat washers in a range of different colors to meet specific application needs. Colors we have available include black, white, red, yellow, green, blue, and natural. Request a quote today for more information on our nylon washers. For more information on Nylon washers, contact us today. What’s the difference between Nylon & Nylon MDS? Nylon is a foundational material on which Nylon MDS is based. It is a version of Nylon with the addition of fine particles. This addition is crucial as it helps improve the load-bearing capacity of the material while still preserving the impact resistance of nylon. What temperature can nylon washers withstand? Heat resistant nylon washers are used in a variety of industrial and domestic applications because of their unique combination of properties. These components have exceptional strength when subjected to temperatures as high as 400° F.
How does Nylon perform in high humidity environments? Nylons performs well in high humidity environments, as it’s able to absorb moisture in equilibrium with the relative humidity of its immediate surroundings. Does our Nylon meet LP410 Standards? New Process Fibre’s Nylon materials meet all LP-410 Standards, assuring that quality is met for custom shapes, washers, gaskets, spacers, and insulators. Does Nylon come in colors? Can we extrude any color? Our Nylon flat washers are offered in a range of different colors to meet specific application needs. Nylon flat washers are offered in black, white, red, blue, yellow, green and natural.